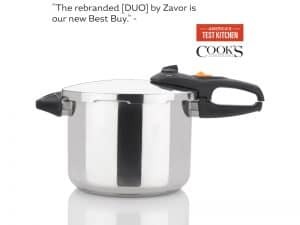 Zavor is honored to have their LUX LCD Multi-Cooker selected as the Best Multi-Cooker by the illustrious America’s Test Kitchen. The LUX LCD was previously named the best in this emerging cookware category by the renowned culinary powerhouse after being put through rigorous testing alongside several competitor units. Now that the LUX LCD has gotten additional features and upgrades, America’s Test Kitchen revisited the unit to see if it still holds up and lo and behold, they liked it even more now! 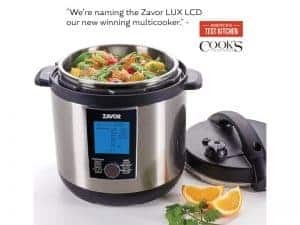 Stating that the unit is even easier to use, they’ve bestowed upon it the title of Best Multi-Cooker with the Zavor LUX as the runner up. Zavor’s LUX LCD emerged on top, outperforming all other brands, including ones with massive “cult followings”. America’s Test Kitchen spent a full year researching these “one-pot wonders” in order to properly test the 5 models they chose. They pressure cooked and slow cooked 100 lbs. of beef/poultry and 20 lbs. of beans twice in each in addition to testing white rice and brown rice while tracking temperatures and pressure levels. They also tested the sautéing/browning functions of all units to really evaluate all they had to offer. They were looking at cooking performance, product features, ease of use and maneuverability to narrow down which is the best of the best. After the 5 weeks of testing were done, Zavor’s LUX LCD emerged on top, outperforming all other brands, including ones with massive “cult followings”. According to America’s Test Kitchen, the LUX LCD stood out in every category. 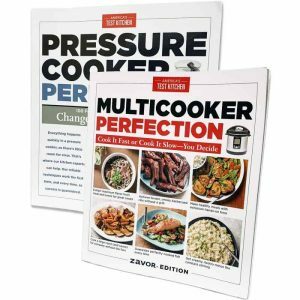 The pressure cook and slow cook functions produced even, properly cooked food (tender, juicy meats; richly flavored and reduced sauces & stews; intact and fully cooked beans) within recipe time frames. The rice cooking functions produced tender, evenly cooked grains for both white and brown rice. The LUX LCD sautéed quickly and browned deeply and evenly. In terms of ease of use, this is where the unit updates came into play. The LUX LCD was easy to program and had a simple, clear and informative interface. The LCD display shows a bar graph – the Preheating Bar – that shows as the pressure/temperature is building inside the unit. The unit showed to have stupendous maneuverability as it was easy to load and unload with food, cook in, open and close and move around. The plastic-coated lid stayed cool to the touch, making for even easier handling. They raved about their favorite features including a lid alarm that tells users when to open or close the lid and the locking panel that allows users to disable all controls to prevent accidental changes and cancelations. Lastly, they were big fans of the blue LCD display that they stated told them clearly what was going on. The display comes programmed with several different icons to assist users each step of the way. Icons that let users know when the unit is preheating, if they need to open or close the lid and remind them to press Start once they’ve programmed the recipe. The panel will even turn green once Start is pushed to let users know the cooking process has begun. Even though the LUX LCD won the title, their choice runner up was the original LUX Multi-Cooker . Needless to say, the LUX LCD got the job done, but the praise from America’s Test Kitchen didn’t stop there. 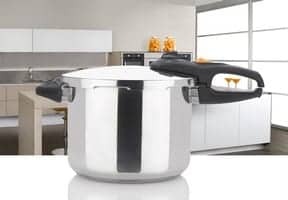 Even though the LUX LCD won the title, their choice runner up was the original LUX Multi-Cooker, stating that it made great pressure-cooked food and was an effective slow cooker. 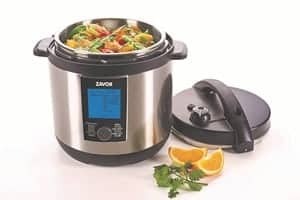 Zavor is no stranger to the multi-cooker category, having offered several multiuse electrics in the past. This latest recognition has cemented Zavor’s position as a force to be reckoned with in this category. In terms of functionality and performance, the LUX LCD offers 10 cooking functions – Pressure Cook, Slow Cook, Steam, Brown, Flex, Simmer, Yogurt, Grains, Eggs and Dessert. The additional Keep Warm and Time Delay programs let users seamlessly move from prepping to cooking to serving without sacrificing time or taste. From chili and rice to dips and dessert, the LUX LCD can do it all. Not only does this unit come with 10 main functions, it also includes more than 30 additional recipe specific settings including a Custom setting that lets users save up to three of their favorite recipes in the unit’s internal memory. The LUX LCD is the perfect cooking tool for all families thanks to the three size options, 4 Qt., 6 Qt. and 8 Qt. The LUX LCD is equipped with a self-locking lid, automatic pressure release setting and two independent pressure control valves. Included with the LUX LCD is a stainless steel steamer basket, a user’s manual, a quick guide and a recipe book with over 70 delicious recipes.